American David Atkinson (203-F-91) put on an amazing game in the last round for Bima Perkasa and that's him to receive a Interperformances Player of the Week award for round 12. The 27-year old forward had the game-high 36 points adding nine rebounds for Bima Perkasa in his team's victory, helping them to beat Pelita Jaya (#2, 4-4) 72-67. Bima Perkasa is placed at 4th position in their group in Indonesian IBL. Bima Perkasa is a typical solid league team placed somewhere in the middle or a little bit lower in the standings. They need more victories to improve their 4-5 record. In the team's last game Atkinson had a remarkable 53.8% from 2-point range and got four three-pointers out of 7 attempts. 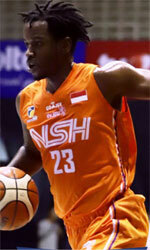 He turned to be Bima Perkasa's top player in his first season with the team. Salem International University graduate has very impressive stats this year. Atkinson is league's best scorer averaging so far 28.2ppg. Atkinson is in league's top in and averages solid 2.6spg. The second most remarkable performance in last round's games was 31-year old American forward Dior Lowhorn (201-F-87) of Satria Muda. Lowhorn impressed basketball fans with a double-double of 31 points and 15 rebounds. Bad luck as Satria Muda lost that game 78-85 to slightly higher-ranked Stapac (#1, 10-1). It was definitely game of the week between two contenders to the top position in Red Group. Satria Muda still maintains its place in the top 3 of the standings, even despite this loss. His team's 4-4 record is not bad at all. Lowhorn is well-known by Satria Muda fans and he already established his position as one of team's most reliable players. He belongs to the best scorers in the league with 23.3ppg (#3). He also registered 10.0 boards per game. The third best performed player last round was American Raymond Miller (204-F-88) of Satya Wacana (#5). Miller scored 17 points and grabbed seventeen rebounds (!!!). Despite Miller's great performance Satya Wacana lost 68-99 to the higher-ranked NSH (#1, 7-3). But his team cannot count on just a single player as he also needs help of the other teammates. Satya Wacana can only dream about fighting for top spots in Red Group. They have rather bad season and 2-8 record places them close to the bottom of the standings. Too bad for Miller he does not play for a better team. But maybe if he did, his season stats would not be that high. Miller has individually a great season in Indonesia. After only 7 games, he made it on the list of the league's leaders in points with 19.3ppg (9th best) and rebounds with 15.1rpg (2nd best). He also has 2.0bpg and FGP: 54.3%.